A strike by French prison guards entered its second week on Monday, with at least 50 jails blocked over demands for better security and pay after a series of attacks by inmates. Prison wardens are gathered together by French riot police as they block the Baumettes jail in Marseille during a nationwide protest, France, January 22, 2018. A strike by French prison guards entered its second week on Monday, with at least 50 jails blocked over demands for better security and pay after a series of attacks on staff by inmates. The protests, which have disrupted prisons across the country, began after a convicted Al-Qaeda extremist attacked guards in a high-security facility with a razor blade, injuring three of them. On Monday, around 150 guards continued to block access to the Fleury-Merogis prison south of Paris -- Europe's biggest -- with tyres and pallets. Last week, police clashed with the guards, using tear gas and baton charges to clear a path through the barricades. The leader of the Force Ouvriere union, Emmanuel Baudin, told AFP that guards had sealed off access to 115 of 188 prisons nationwide on Monday. 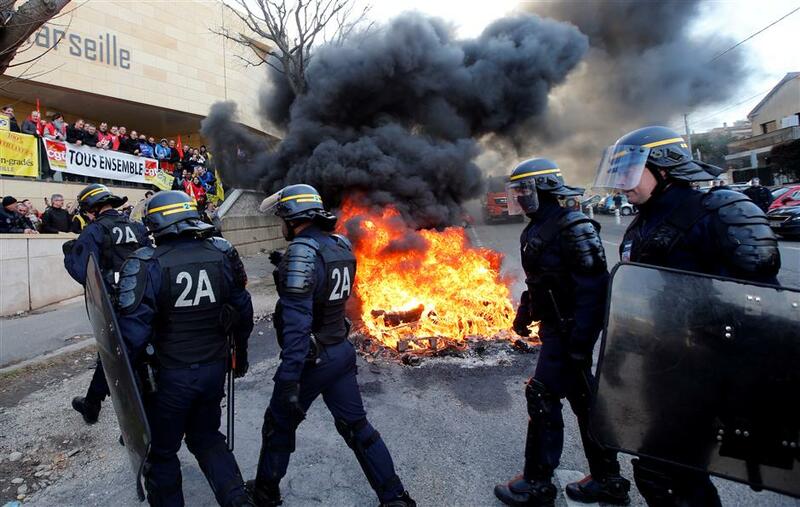 Prisons in and around Paris, the area around Lyon, the eastern Alsace region and the island of Corsica were affected, according to the unions. The penitentiary service put the number of jails suffering disruptions at 50. French prisons have developed a reputation for being hotbeds of radical Islam that have turned out some of the jihadists behind a series of bloody attacks in the past three years. Prison guards complain that the conditions in which violent and radicalised inmates are held are too lenient. Last week, three inmates at a prison on Corsica, one of whom was under surveillance for Islamic radicalisation, attacked two guards with a knife, wounding one of them seriously. In the northern Calais region, a male and a female guard were treated in hospital for injuries on Sunday after being attacked by a prisoner with an iron table leg. Over the weekend the guards rejected proposals from Justice Minister Nicole Belloubet on improving safety and vowed to dig in. The justice ministry has proposed creating 1,100 guard jobs over four years, improving security for guards and creating a special regime that allows for a "total lockdown" on the most dangerous detainees, measures dismissed by the guards as insufficient. Belloubet was to hold further talks with union representatives on Monday. French prison guards have long complained of low pay, insufficient staffing and overcrowding. The average occupancy rate in French prisons is 118 percent, but at some prisons such as Fresnes near Paris it has risen to around 200 percent, forcing some prisoners to bed down on mattresses on the floor. Adding to the guards' concerns is the radicalisation of inmates who come under the sway of Islamic extremists. Of the roughly 70,000 prisoners held in French jails in December, 504 were convicted or awaiting trial on terrorism charges and some 1,200 others were under surveillance for radicalisation. The tipping point for many guards came when German convict Christian Ganczarski, a former top Al-Qaeda militant, attacked three officers with scissors and a razor blade. President Emmanuel Macron has called the overcrowding in prisons "disgraceful". He has vowed to create places for an additional 15,000 inmates and switch to a "massive" use of alternatives to incarceration, such as community service or freeing prisoners fitted with an electronic bracelet.